This week was going to be about two things: 1. I wanted to try out a cool combo that beat me over the head at our recent One Big Weekend; and 2. I wanted to kick my horrible Clayface addiction. I accomplished one of those. This lady was the centrepiece of my Team. She is basically a “When Fielded” version of Breath Weapon. You KO her with her own ability and you get to recycle her on the next turn. So, you could be doing Breath Weapon 1-3 damage on every turn if the rolls cooperated. This is one of the cooler abilities hidden in the new Justice Campaign Box. This alone is great, and can be seriously frustrating to play against, but how can you make it better? Hello Black Adam! He has some really interesting cards in the Mystics Team Pack, but this one kind of stood out for this build. While he is active, when a Legion of Doom character die KO’s another die, the Opponent will lose life for each instance. Poison Ivy should be doing her fair share of KO’ing and her LOD status makes this much more effective. 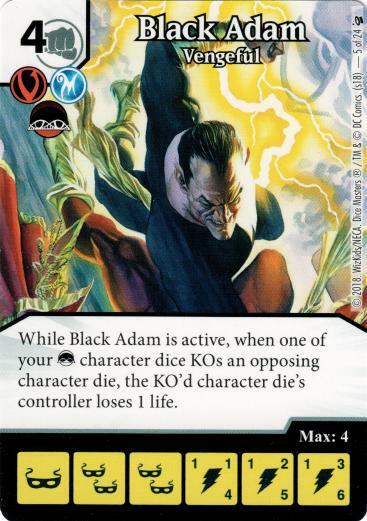 We did discuss this interaction before play and since Black Adam does not specify that this damage must be combat damage, we agreed that ability damage should count too. This might need an official ruling, but it is how we played it tonight. These two cards would be the core of the combo. The Team: Girls Night Out. So far, Ivy and Adam do not really fit the title of this article. Let’s fix that now. When I was first introduced to Poison Ivy at our draft, she was paired with this Zatanna. Now, your minimum Breath Weapon will be a two no matter what character side Ivy is rolled on. 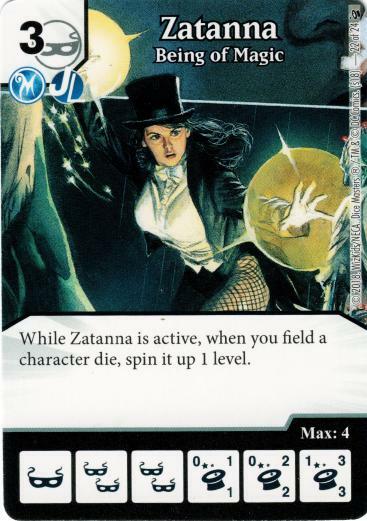 Zatanna also makes everything else a little stronger with higher stats. Add this into the mix and the combo becomes just that much stronger. Still not enough ladies to make this name work. I dove into Ivy’s past and pulled out one of her gal pals, Harley. This gave one more layer of damage to the combo. I will for sure have Adam and Harley in the Field, so I should be able to make good use of Harley’s life loss/gain ability. Since Adam works well with LOD, I decided to add in a few other members to help with some supplemental pieces. I decided to give the new taxing Scarecrow a try tonight. This was more of a test run to be honest. I didn’t really have a plan in plan in mind for using him. The other LOD piece was Parasite (no… not THAT one). I went for the one to strip abilities from annoyances across the board when necessary. Since my core was based around purchasing multiple 5 cost characters, I needed the Kree Captain Global. Since, I am trying to remove some of my crutches, I decided on the 2-cost over the buffy one. Here is pretty much where I fell off the Clayface wagon. CFG and KCG are just so potent together, and by using the two cost version of Kree Captain, I could pull some shenanigans to grab his double fists to make use of his Global. I am weak and put Clayface on the Team. Since attacking was really not part of the plan, I put in Static Field to help keep my stuff around incase of a force attack. The final piece of the puzzle was Thrown Brick. This Team lacks ramp, and this is not a bad option. It also serves as a way to soften up characters to make better use of Ivy’s ability. Let’s see how this machine ran. The first game was up against a Wong/Parasite-based punch you in the face Team. With a nice mix of Elektra to protect them from being blinked back. I pulled a nice trick on T1 (thanks Reg) where I managed to buy two Bricks going first (roll 1 mask and two other energy, buy one brick, CFG the brick out, and buy another one). Now with the Brick advantage on my side, I started to build my engine. I got Zatanna and Adam out and waited for the Ivy train to start. He had Iron Fist to make Ivy a little less effective, and Elektra made it difficult to taunt his stuff out with his Black Widow force attack. I needed level 3 Ivy’s to really do some damage… and I was getting them with some decent frequency thanks to the Thrown Brick churn. The combo of Ivy and Adam did some serious damage and drained his life pretty quick. The bigger his board was, the better the target it made with Ivy. They worked really well to finish things off. I did have Harley going on during this game, but forgot to trigger her ability for a few turns. It would have sped things up a bit, but she was not a game breaker. We played a second “fun” game where it went very similar. Once the train started, it was difficult to stop. Up against out resident youngster. I decided to take the foot off the gas and play around with some other pieces here. I eventually got Adam out and she had Scarecrow’ed my own Clayface. Never intending to buy the character, I took it as a challenge to buy a 9 cost Clayface. The Bricks got me there fairly easily to be honest. I decided from here on out, I would work on getting Clayface out and trigger his Overcrush ability. I kept swinging with my massive Clayface and thanks to Adam and Harley, I was burning her down with every KO. Eventually, I won at the beginning of my turn thanks to Harley. Up against Gord and his Sidekicks of Death. I knew he had a toolbox of bad things and decided I would try to tax him with Scarecrow (mistake #1). I again gained the Brick advantage, but they would only come out when there was nothing to use them on. My Team slowed down and it took way too long to get going. He was burning me with multiple tools at his disposal. I decided to fall back on my buy Clayface strategy since I was more of less dead already. I could not get the energy to line up when it mattered (I had a shot at two Clayfaces at one point, but couldn’t trigger the Overcrush). I made a bit of game of it in the end as I managed to get Adam going with a small Ivy army. Alas, too little, too late. IF this ability works how we think it does… it works amazingly! Even without Adam, Ivy is an effective way to clear out a Field. Adam just makes it THAT much better. Zatanna was just icing on the cake. Any way to make Ivy more effective was a good thing. Harley was a fun thematic addition, but really not a major player tonight. KCG and CFG are just great… period. You want to make the best use of these Globals, put them on the same Team and watch your purchase costs drop. The big problem with the CFG, is the lack of churn. It can make your bag grow very easily, so you need to have a way to manage it. Thrown Brick should have served this purpose. When it worked… it did this job well. When it didn’t… it was a slow slog through the bag. Scarecrow slowed me down when I purchased him. I think that was more of a fault of the poor churn in that game. I think he can be a good piece when you get him early enough. This Parasite might be one of those hidden gems that get overlooked by his much more popular brother. His ability is actually pretty great. You can shut off something on the other side for a turn and maybe make use of it yourself. He came into play exactly once tonight, but I see some potential here. Overall, this was a fun build to play around with. The benefit of Adam and Harley’s life loss abilities are just great. You currently cannot stop life loss (thus getting around annoying Widows). As I already said, Ivy herself is incredibly good. This is absolutely a combo I recommend playing around with. 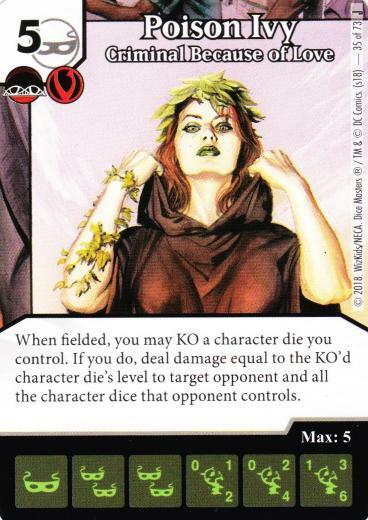 I think Ivy has some potential use in a more competitive environment. She definitely needs some testing to see if you can get her working and cycling fast enough. Have you played around with the Criminal Because of Love? What combo did you come up with? Let us know in the comments below.